Deck with mountain views, hot tub, pool, 2 bedrooms, 2 bathrooms, sleeps 4-6. Now with an indoor hot tub! Ideal romantic getaway for 1 or 2 couples. The home can also accommodate a small family. Enjoy a lovely home, a beautiful view, and acres of mountain forest — Your own private park! • New sheets, comforters, etc. • Glass-walled sun-room patio with couches and hot tub. • In the Summer: a small outdoor wading pool for cooling off. • New kitchen appliances, towels, pans. with the peace and quiet of few neighbors and no city nearby. 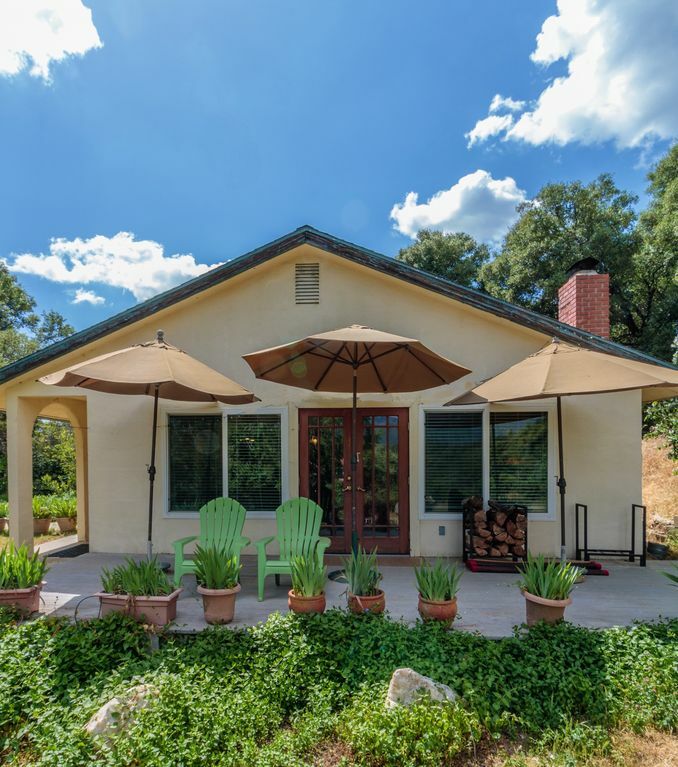 The home is near Yosemite, Bass Lake, Mariposa, and Oakhurst. New bedspreads and sheet sets. I am writer, and I've enjoyed living in the mountains for more than a decade. I live in a separate house near the rental home. I've always loved the mountains, and this place offers both the privacy and views you want without being too remote or isolated. The house has several large rooms, and plenty of land to enjoy -- practically a private park of more than 15 acres. The view from the deck and living room is especially expansive. The deck looks out across a nearby ridge, with even higher mountains behind it. Electric wall heaters in each room. Fireplace available in Winter. New silverware and pans. Plates, glasses, mugs etc also provided. Large-screen TV with Apple TV attached. The best speakers made: classic Klipsh Horns. Front deck with mountain view, back patio by grill and pool. In the Summer: Small outdoor pool for cooling off — 30 inches deep, 4x8 feet. Wished we had booked more days. Paul was kind, informative,thoughtful and intelligent. He greeted us upon arrival and gave us a rundown of the place. The house itself was wonderful, a perfect place for a quiet retreat. There is no better place to stay in the area! We will be back next year. Thank you Paul!!! Thanks very much for the kind review! Michael and his family were great guests, and I was very happy to have them here for the week of Christmas. When checking out they even went above and beyond and cleaned out the fireplace -- which, to be clear, is not a guest's responsibility! -- but was still very appreciated. What a quiet, serene setting to get away from the hustle & bustle of pre-Christmas preparations! Paul is a wonderful host & lives in the house next to the rental. He was right there to greet us, send us off, and with a solution when we needed help with the sound on the TV & when the toaster didn't work. Keep in mind that there is no live TV available, but plenty to watch on Netflix, etc. when you're not enjoying the hillside views. The property was very clean & the indoor hot tub & the fireplace with plenty of wood were a nice bonus. Merry Christmas! Loved my time, the host made special accommodations and was very friendly. I recommend. Very comfortable home in a quiet & beautiful setting. Paul was awesome in getting us settled in a bit early, and making us feel at home. Would recommend this highly as a place to stay for visiting Yosemite area, or central California for relaxation & sightseeing. We definitely want to return for another stay. The house atop Twin Peaks is a few miles from the border of Yosemite Park -- an hour's drive to the main attractions in Yosemite Valley. No pets or smoking. Guests must sign Rental Agreement.